Imagine a country where the right to vote is not guaranteed by the Constitution, where the candidate with the most votes loses, and where paperwork requirements and bureaucratic bungling disenfranchise millions. You're living in it. If the consequences weren't so serious, it would be funny. An eye-opening, fact-filled companion to the forthcoming PBS documentary starring political satirist and commentator Mo Rocca, Electoral Dysfunction illuminates a broad array of issues, including the Founding Fathers' decision to omit the right to vote from the Constitution--and the legal system's patchwork response to this omission; the battle over voter ID, voter impersonation, and voter fraud; the foul-ups that plague Election Day, from ballot design to contested recounts; the role of partisan officials in running elections; and the anti-democratic origins and impact of the Electoral College. The book concludes with a prescription for a healthy voting system by Heather Smith, president of Rock the Vote. Published in the run-up to the 2012 election, Electoral Dysfunction is for readers across the political spectrum who want their votes to count. Victoria Bassetti has worked with legislative and judicial bodies of the U.S. government, including serving as chief counsel/staff director to a subcommittee of the U.S. Senate Judiciary Committee. She has been active in numerous political campaigns and participates regularly in Election Day voter-protection efforts. 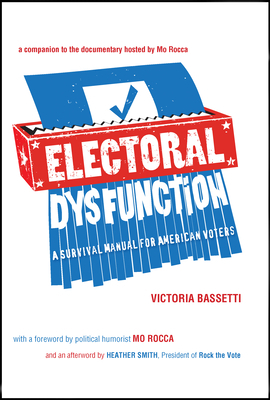 Electoral Dysfunction is directed by Bennett Singer, Leslie D. Farrell, and David Deschamps, whose credits include multiple Emmy, Peabody, and duPont-Columbia awards.